An ornamental woodland garden, full of exotic plants, that is designed to be interesting all year round - for full details on the plantation, please click on this link to the Royal Parks website. A beautiful Georgian mansion set in 13 acres of landscaped grounds with spectacular view. 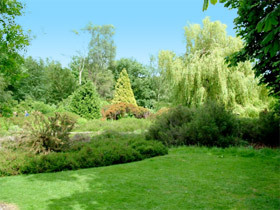 Further details on Pembroke Lodge and its amenities can be found here.